Hot Spiced Gingerbread, sold in oblong flat cakes of one halfpenny each, very well made, well baked and kept extremely hot is a very pleasing regale to the pedestrians of London in cold and gloomy evenings. 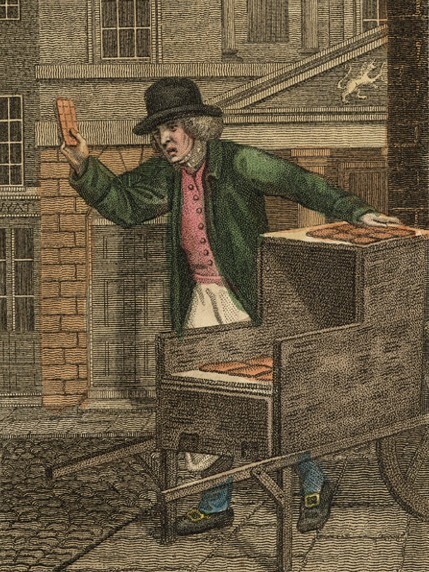 This cheap luxury is only to be obtained in winter, and when that dreary season is supplanted by the long light days of summer, the well-known retailer of Hot Spiced Gingerbread, portrayed in the plate, takes his stand near the portico of the Pantheon, with a basket of Banbury and other cakes. 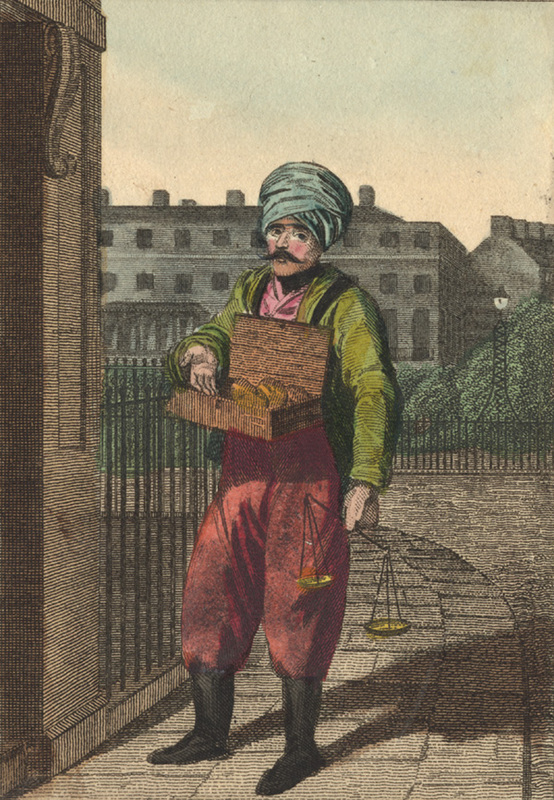 This ‘gingerbread man’ was one of over 30 street traders featured by William Marshall Craig in his book, Itinerant Traders of London. Craig himself seemed pretty impressed by the cakes, describing them as ‘very well made’ and ‘well baked’, and cheap at the price of a ha’penny. We don’t know whether the unknown ladies of our Cookbook ever patronised this street trader’s stall at the Pantheon, but we do know that they were fans of gingerbread. 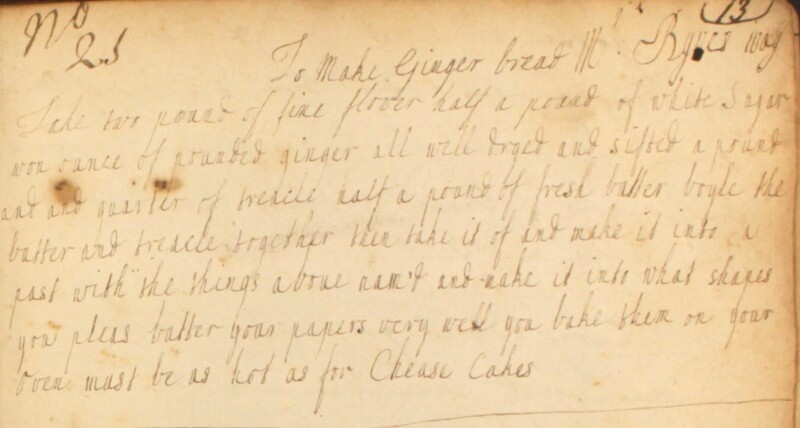 They recorded two recipes for this spicy cake in their manuscript recipe book. Take two pound of fine flower, half a pound of white sugar, won ounce of pounded ginger all well dryed and sifted, a pound and a quarter of treacle, half a pound of fresh butter. Boyle the butter and treacle together then take it of and make it into a past with the things above nam’d and make it into what shapes you pleas. Butter your papers very well you bake them on. Your oven must be as hot as for Chease Cakes. The second recipe is a little different from the gingerbread we’re used to today. Along with the ginger, caraway seeds and candied citrus are used to flavour the mix. It sounds rather intriguing… one to try as warming treat at tonight’s Bonfire Night celebrations? The mixture also contains eggs, so although our ladies make no mention of cooking, don’t forget to bake it! 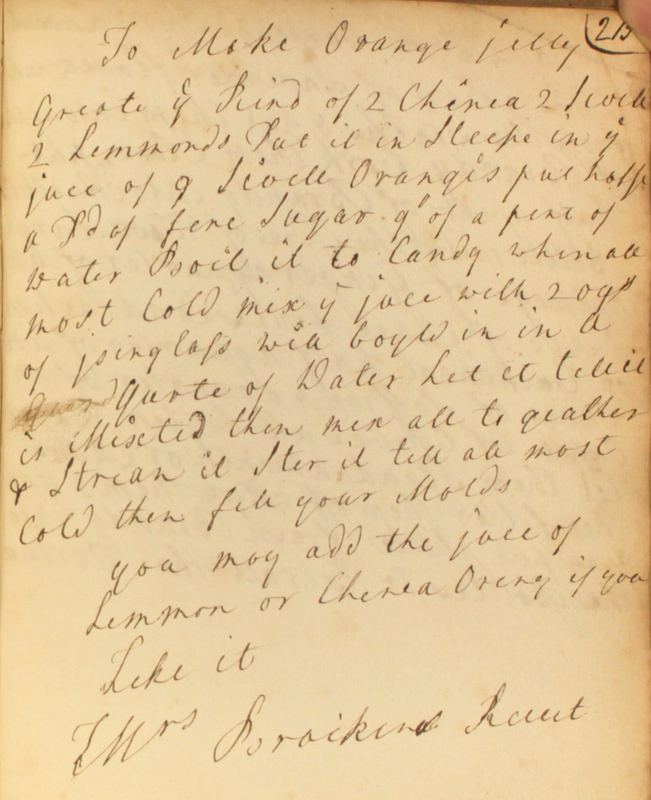 A Georgian gingerbread recipe from The Cookbook of Unknown Ladies. 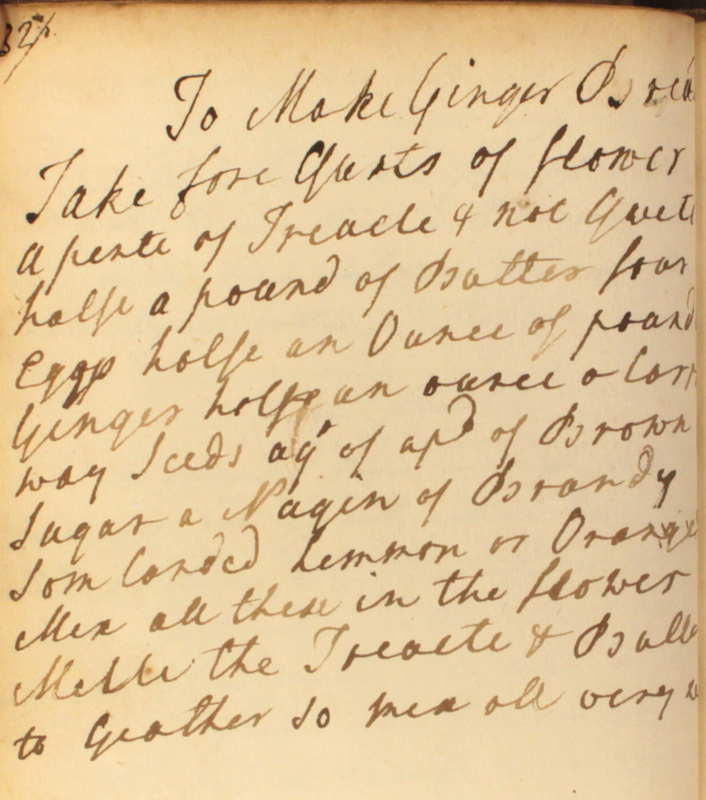 Take fore qurts of flower, a pinte of treacle, & not quite halfe a pound of butter, four eggs, halfe an ounce of pounded ginger, halfe an ounce of carraway seeds, a qr of a pd of brown sugar, a nagin of brandy, som canded lemmon or orange. Mix all these in the flower. Melte the treacle & butter to geather. So mix all very well. Here’s a recipe for someone who knows a bit about butchery! Many of us have lost these skills now that poultry and other meat can be bought fully prepared and packaged from the supermarket.In the Cookbook of Unknown Ladies there are no such shortcuts. 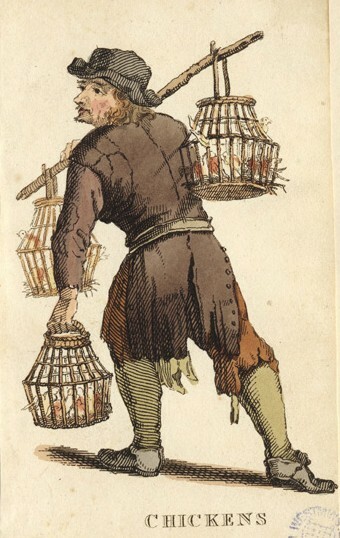 Georgian cooks had to be prepared to get their hands dirty, as chickens were sourced live from small-holdings or street traders. Vendors announced their arrival with the cry of ‘Buy my fat chickens‘ as they walked the London streets with cages of chickens slung over their shoulders. In this recipe for a white fricassée, three large chickens need to be gutted, skinned and jointed before being popped in the cooking pot. Take 3 large chickens, skin them & cut them joynts & wash them very white & rub them with a dry cloath & then boyl very well in water whitend with a little flower. 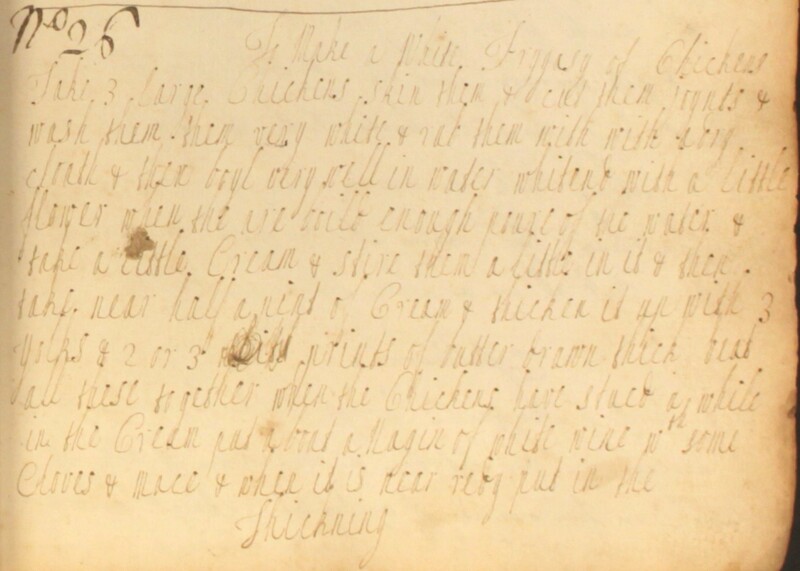 When the are boild enough poure of the water & take a little cream & stire them a little in it & then take near half a pint of cream & thicken it up with 3 yolks & 2 or 3 prints of butter drawn thick. Beat all these together. When the chickens have stued a while in the cream, put about a nagin of white wine wth some cloves & mace & when it is near redy, put in the thickning. Dairies would use a carved wooden stamp to ‘print’ their pats of butter. 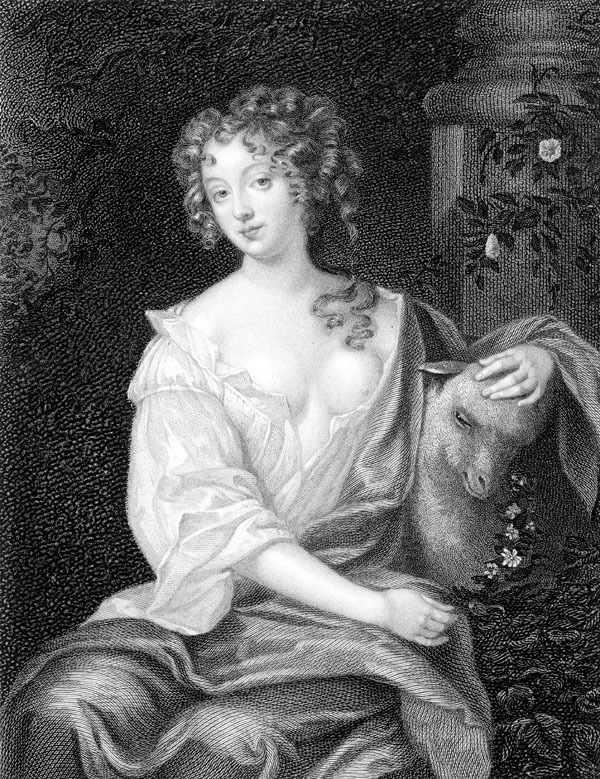 The print design could feature a simple emblem, such as a thistle, or even comprise the producer’s initials. As well as being decorative, it marked the butter as the work of a particular producer. Once stamped, each pat of butter would be wrapped in linen for sale. A nagin or ‘noggin’ was a measurement of spirits, equivalent to ¼ of a pint.